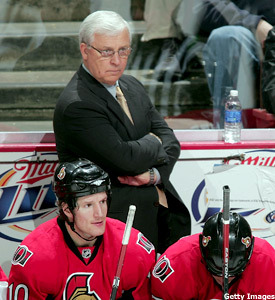 Bryan Murray hopes to bring back the emotion Ottawa had during its 15-2 start of the season. Bryan Murray is hoping to bring back the emotion to the team he coached to the Stanley Cup Final last season. A week after relieving John Paddock as coach of the Senators, Murray had no problem finding his own emotion as he renewed acquaintances with some of his favorite people in the game, NHL referees. Monday night, Murray was ejected after arguing a call during the Senators 3-1 loss in Anaheim. Murray knows he has a knack for arguing calls and chirping in the ref's ears; but he insists it is a product of the passion he has for coaching a game and represents the passion he would like to see his players exhibit on a game-to-game basis. "I like to get into it and express my opinion and I'm very emotional when I'm behind the bench," Murray said recently. But Murray isn't exactly sure he and the men in stripes are happy to be interacting on a regular basis once again. "I don't think happy would be the word," Murray joked. "That's probably one thing they don't miss." As far as how he feels about taking over for Paddock, Murray didn't exactly miss coaching. To say the least, he is disappointed with his club's recent performance and lack of emotion since a 15-2 start. Prior to Paddock's firing, the Senators had dropped six of their last eight games and 14 of their last 21. After back-to-back shutouts to the Bruins and Leafs last week, Murray decided a change was necessary. "I tell you, I didn't think I'd be in this position again and had considered myself done with coaching," Murray said. "I had settled back into my management career and was comfortable doing that. But, I think the results that we'd been having or not having, was an indicator that some adjustment, that some emotion, had to be brought back to the team." It is Murray's aforementioned emotion that he hopes will rub off on a team that has been unable to find it on a nightly basis since its torrid start. Murray didn't necessarily fault Paddock for everything that has gone wrong during his team's fall from grace. But Murray does believe that this is a group that has shown a tendency to take on the personality of its coach or on-ice leaders. "You know people always say to me that a team takes on the personality of a coach, and John was more laid back than I am," Murray says. "I didn't see that in the players when we started the season, but as we started to lose more and didn't get that consistent effort, I think maybe, yeah, that plays a factor. Look, I feel bad for John and this isn't all his fault, but I think sometimes, when things are going the way they have here, there needs to be more emotion all around." Murray has seen signs of that, but just when it seems as if his team may have turned a corner, it has another lackluster game. "You look at some of the games and it's there," Murray said of the desired effort and emotion. "But (it's) not always for 60 minutes and not game-in and game-out. We need that back. We have a very skilled team. I've said all along that I think our secondary scoring isn't where it should be and that comes with hard work. "We need that depth scoring. We can't just hope our top line gets the job done. The other players need to follow their lead." As for the much-maligned goaltending of Martin Gerber and Ray Emery, Murray isn't thrilled by any means with the performance, but he believes they can do what he has asked them to do -- and that's simply to stop the shots they're expected to stop. "Stop the puck; that's it," Murray said. "We're not asking them to make amazing saves, but just stop the ones you should stop, and we go from there." During the past two seasons as the Senators coach, Murray was 100-46-18. Heading into this season, he was sixth in games coached with 1,221 and fifth in wins, with 613. Yet, despite his success and experience, Murray realizes this go-round behind the bench could be one of his greatest challenges. It will also be one of his greatest achievements should the Senators get back on track and make another playoff run. "I believe in this team and I believe they have what it takes to turn this around, but the players need to go out there and do it," he said. "I didn't think I'd be here again, but I am and I'm going to try and get things back to where they should be." Shootout Summary -- Last Wednesday against Florida, the Maple Leafs were able to come back in the third period to tie the game and then win it 4-3 in the shootout. Defenseman Tomas Kaberle scored the winner in the shootout and goaltender Vesa Toskala was perfect to help Toronto to a much-needed win, keeping it in the hunt for the playoffs. On Saturday the Bruins were able to hang around in regulation and then beat the Thrashers in the shootout. Phil Kessel scored for Boston in the shootout and Tim Thomas stopped all three shots, including an Ilya Kovalchuk attempt, avenging a penalty-shot goal Kovalchuk had scored on Thomas in the first period. Boston -- Patrice Bergeron continued to make great strides this past week in his recovery from post-concussion syndrome. Bergeron has been skating and practicing with his teammates and is still holding out hope that he may play this season. Until then, he remains on Injured Reserve. Defenseman Andrew Alberts is also making progress as he recovers from a neck injury. While he remains on Injured Reserve, there's a chance he could return within the next two weeks. Goaltender Manny Fernandez is also shooting for a return this season as he recovers from knee surgery. He is still on Injured Reserve but like Bergeron, has been skating and practicing. Defenseman Aaron Ward is sidelined by yet another injury. Ward showed up at the rink Tuesday on crutches, compliments of a bruised bone. He is listed as day-to-day. Buffalo -- Forward Jochen Hecht is closing in on a return but is still day-to-day with a pulled leg muscle. Forward Michael Ryan is still out with a groin injury and is listed as day-to-day. Tuesday, the Sabres also lost the services of defenseman Henrik Tallinder when he left the game against Philadelphia with a shoulder injury. Montreal -- Steve Begin is day-to-day with a groin injury. Ottawa -- The Senators could be without captain Daniel Alfredsson on Wednesday night in San Jose. Alfredsson suffered a rib injury Monday against Anaheim and also has some back spasms. Forward Chris Neil was placed on Injured Reserve last week with a knee injury. Toronto -- Forwards Mark Bell (broken orbital bone), John Pohl (sprained ankle), and Darryl Boyce (dislocated shoulder), and Boyd Devereaux (torn right MCL), all remain on Injured Reserve. Alexander Ovechkin will try for goal No. 53 Wednesday night as Buffalo hosts the Capitals. The Senators are in San Jose. Thursday, the Bruins and Leafs hook up in a divisional tilt in Boston. That same night, the Canadiens are in Phoenix and Ottawa plays in Los Angeles. Saturday is a busy day in the Northeast Division. The Bruins try to avenge Monday's 10-2 loss to the Capitals as they host Washington in a matinee. Montreal takes on the Kings in another matinee. The Senators are at Phoenix, the Maple Leafs host the Devils and the Sabres play at Carolina. Sunday, the Bruins and Rangers meet at MSG in a matinee and the Canadiens play later that night at Anaheim. The Sabres host the Rangers on Monday. Tuesday, Toronto hosts the Flyers, the Devils are in Montreal and the Bruins play at Ottawa.